The easy pieces seating concept by internationally successful designer Kati Meyer-Brühl has been nominated for the Bundespreis Ecodesign, which will be awarded by the German Federal Environment Ministry and the German Federal Environment Agency in November 2012. The Ecodesign prize is awarded to products, concepts and innovative designs that are an outstanding combination of a high level of originality, design quality and environmental friendliness. easy pieces is distinguished by its clear, transparent design, easy adaptability and versatility, achieved with the aid of loose, reversible pads that can be turned either way in a mosaic of different colours or materials. They allow the never ending, customised adaptation of this piece of furniture to different living requirements and environments. The armchairs, sofas and recamiers are manufactured on the basis of durable, environmentally-friendly components and using particularly sustainable processes. The different types of wood used for the base frames come from certified, mainly local, sustainably managed forests, all of the upholstery covers are removable. easy pieces is therefore the embodiment of brühl’s goal of combining sustainability and environmental awareness with aesthetics and joie de vivre. 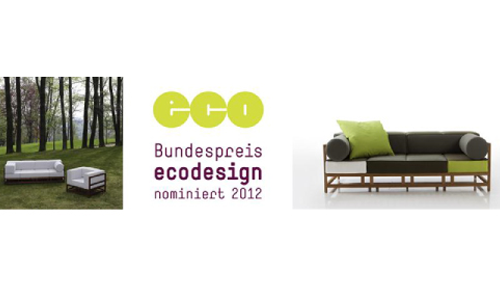 The Bundespreis Ecodesign will be awarded for the first time in 2012. It was created to highlight innovations in the area of ecological design in order to raise public awareness of the issue of sustainability. Cologne-based design professor Günter Horntrich presides over the highly qualified jury.